Compared with world-famous classic Guilin attractions like Elephant Trunk Hill, Reed Flute Cave and Li River, Longsheng scenic area seems quite understated. 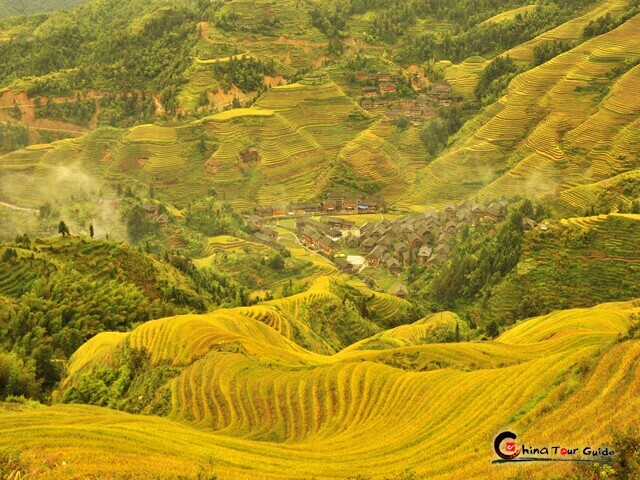 However, it is Longsheng that surprises the world with gorgeous rice terraces and vibrant ethnic custom like long-hair Yao women. 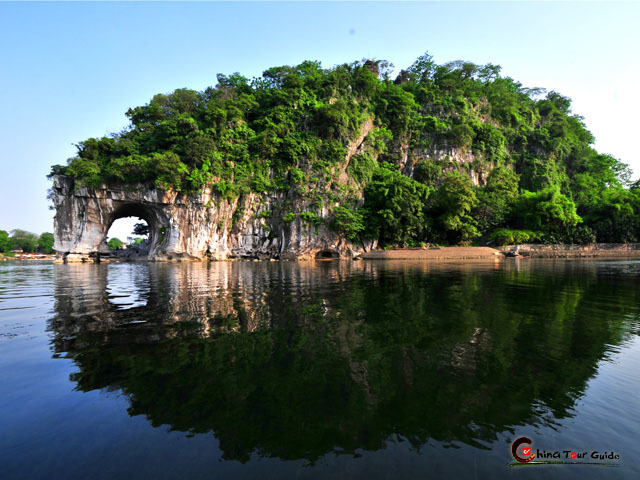 This tour will give you a brand-new Longsheng wonderland besides attractions in downtown Guilin. Come and uncover it! Marvel at breathtaking scenery of Jinkeng Rice Terraces. 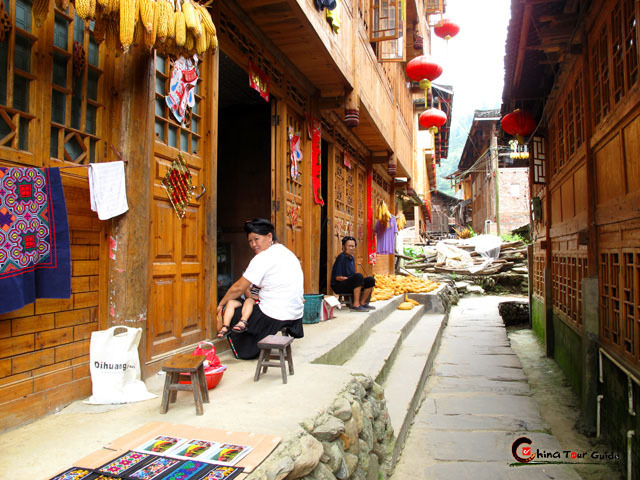 Visit Dazhai Village to explore mysterious Yao custom. Enjoy cute Elephant Trunk Hill and color-rich Reed Flute Cave. Today's Activities Arrive in Guilin, a city celebrated for its glamourous landscapes. Our local guide will pick you up and take you to the hotel. A day to restore your vigor and prepare for next day’s activities. Perhaps having a night cruise around the area of Two Rivers and Four Lakes is a nice way to get closer to the city. Today's Activities Let’s set out from downtown Guilin at about 9:00 A.M. With 2 hours driving you would arrive at the parking lot of Ping’an Village. The following hiking from the parking lot of Ping’an Village to Ping’an Inn (about 30-50 minutes) is much like strolling in a fantastic landscape scroll. 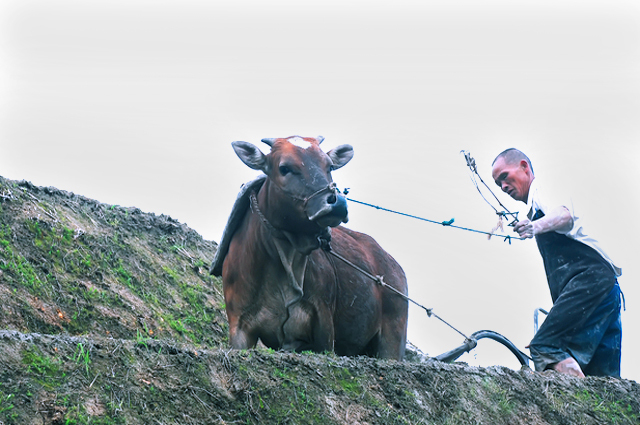 You’ll be amazed with the rice terraces, the strong stilted buildings uphill, the ethnic garment of Zhuang folks who make the majority of Ping’an Village. Then check in and enjoy a good lunch at Ping’an Inn. Take a 20-minute hike and you arrive at the No. 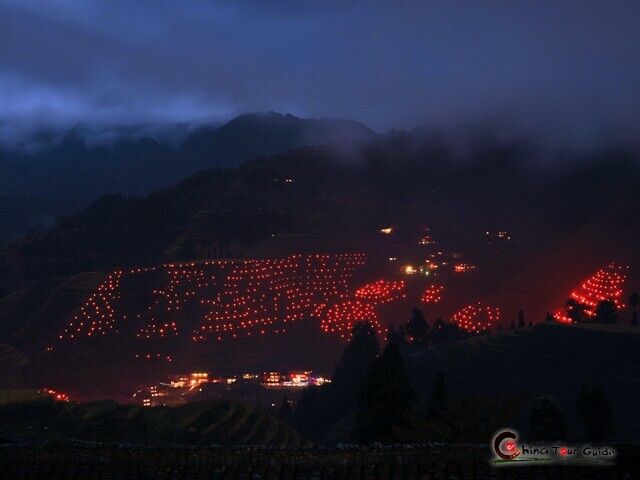 2 attraction of Ping’an Rice Terraces, The Moon in Company of Seven Stars. Have a good view of the way one rice terrace fields and seven smaller ones work such a miracle. Then you’ll leave for the No. 1 attraction, Nine Dragons and Five Tigers. It’s another masterpiece created by terrace fields of various shapes and sizes. Walk back to Ping’an Village and stay overnight at Ping’an Inn. If you want to experience more about Zhuang ethnic culture and art, the local choir is highly recommended. The real beautiful voice of the performing locals, their ballad and their dance are all fresh and fantastic to you. 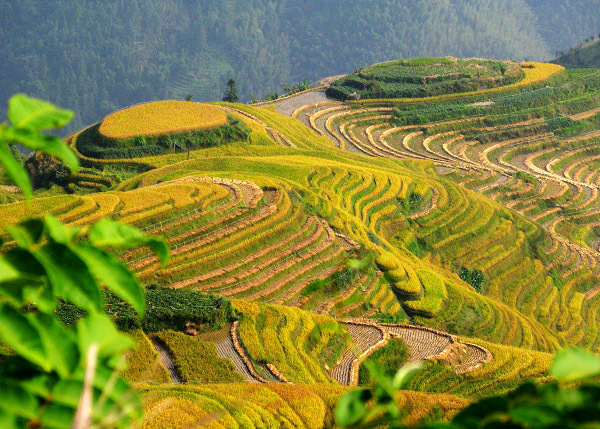 Today's Activities At about 9:00 A.M, let’s start hiking from Ping’an Rice Terraces to Jinkeng Rice Terraces. In the 4-hour hiking we keep marveling at the fabulous Jinkeng Rice Terraces. 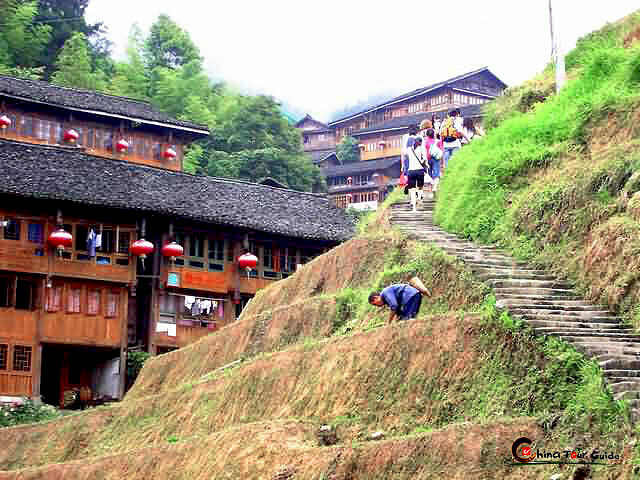 Then, hike downhill from Tiantou Village till you reach Dazhai Village where Yao people live. Sure it’s interesting to visit such an exotic village. During the 1-hour visit you’ll get a deeper understanding of their lifestyle, their way to adorn their home and themselves, their legend and customs, etc. Afterwards, go to the parking lot of Dazhai Village where the driver has been waiting with your luggage and drive back to downtown Guilin. 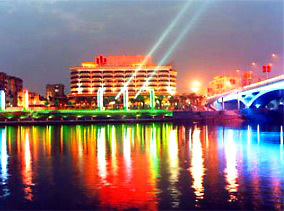 Today's Activities The whole downtown area of Guilin, in fact, shows itself as an Oriental edition of Venice. Li River, Peach Blossom River (Taohuajiang) and four lakes come together and build a grand web of waters. After a good rest of half day, you'll start a cruise in Two River and Four Lakes Area. The beautiful scenic spot is without doubt a wonderful appetizer that helps you get off fatique of hiking yesterday and better collect vigor for the following day’s playbill. After 1-hour cruise, you’re going to meet an awesome city wall, Ancient South Gate of Guilin. Constructed in Tang Dynasty (from Year 618 to 907), the time-honored gate, along with other symbols of Guilin, protects the picturesque landscape here with dedication. Such a visit would add more to your understanding of Guilin history. Today's Activities The last day of your Guilin tour gives you a 30-minute visit to Elephant Trunk Hill, the icon of Guilin city. You'll love it more after feasting on so many Guilin attractions. Later, your eyes need to be active cause you’re heading for Reed Flute Cave. That cave is a natural platform of intense color riot. Stalactites, stone pillars, curtains and blossoms look so unbelievable under the purple-blue light. Wow, words fail you for sure! The stunning scenery of Guilin will go on hitting your minds on your flight back home! - Other optional tours / meals / flights not mentioned in itinerary; - Tips for tour guides and drivers. First opened in 1988 and renovated in 2008, Sheraton Guilin Hotel is ideally located on the west bank of Li River within minutes' walk from the Elephant Trunk Hill and Fubo Hill. 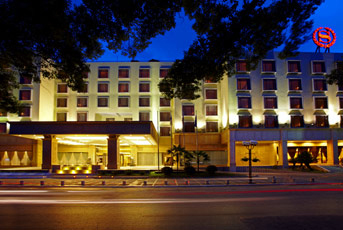 It's about 2km from the Railway Station and 30km from the Guilin International Airport. 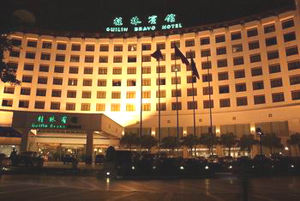 Guilin Bravo Hotel is located in the city centre besides the Banyan Lake Park. It's 28km from Guilin Liangjiang International Airport and 3km from Guilin Railway Station. The hotel Boasts 329 tastefully decorated guest rooms and suites and various facilities to meet the guests' different needs. Hotel Universal Guilin is situated on the bank of Li River, within walking distance to the local market, shopping area and tourist hot spots. The tastefully decorated guest rooms and a wide range of facilities and services provide guests with a comfortable and joyful stay. Sitting on top of a mountain, bordering a local village and overlooking magnificent rice terraces, Li-An Lodge is an entirely wood structure implementing the Chinese traditional building technique of tongue and groove without a single nail. The lodge was created by Keren Su, a renowned photographer, painter and adventurous world traveler, who discovered this enchanted location during a photography trip in 1997. 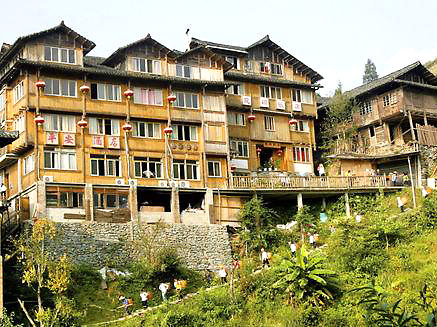 Opened in 2003, the Pingan Inn is situated in the famous Longji Terraces Scenic Area. It is 100km away from the Guilin Railway Station and the Guilin International Airport. The hotel enjoys a graceful environment. 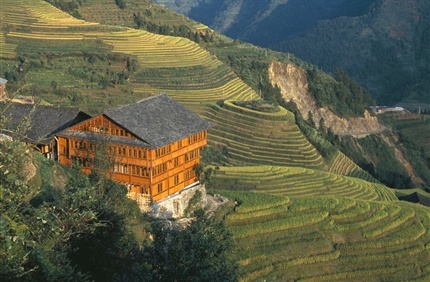 Some of guestrooms offer you the perfect views of the landscape of Longji Rice Terraces. You’ll indulge yourself in tranquilization and coziness here. 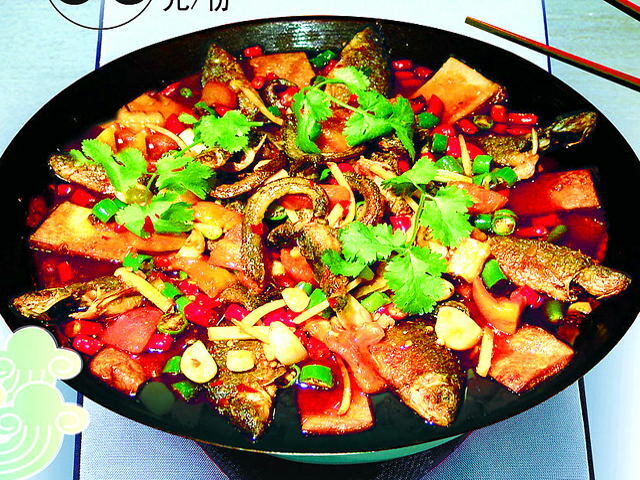 Guilin's tasty dishes are also well-known except its charming landscapes. Traditional cuisines include Duck Stewed with Ginkgo Seeds, Lipu Taro Pork, Stewed Clams and Chicken, Lohan Boiled Chicked, and Fried Chicken with Water Chestnut. 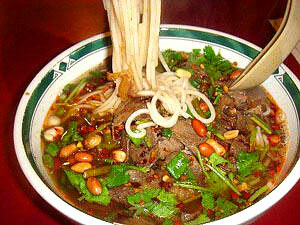 An abundance of special snacks are also offered throughout the city, like the famous Guilin Rice Noodles. 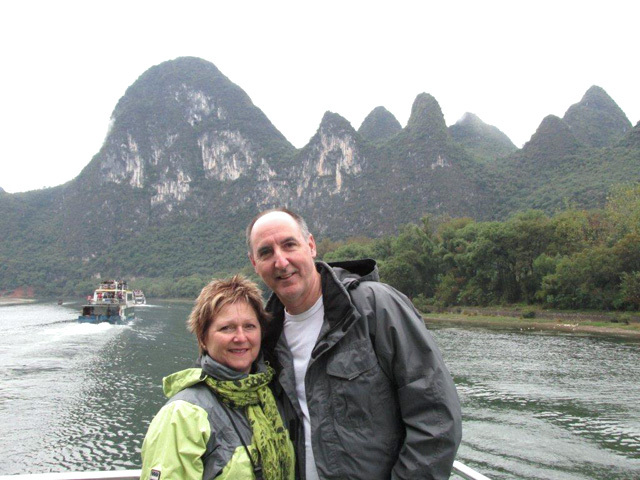 The Li River Cruise was so exciting. The Li An Lodge was excellent, and its rooms were so individual and elegant-looking. From the room my family and I enjoyed a spectacular view of the minority celebrating their harvest with torches all over the mountain. Plus, I love the Ancient Zhuang Village so much. It was a fairyland every inch. We would sure come next spring to see the glossy ponding rice terraces. I have appreciated a great deal you professionnalism since November 2011 while preparing the extension part of our trip in China. I was very pleased about the fact that you did all you could to contact us for the Shanghai/Guilin flight time change. Also I was happy talking to you in Yangshuo when we asked for a "western style" meal !!! Concerning the whole package you organized for us I can say that we were very satisfied about eveything. In Guilin and Yangshuo, Jennifer was very nice with us. She did all she could to please us. In spite of the bad temperature the day of our arrival and the next one, we found Guilin, the Li river, Yangshuo and its countryside wonderful, and the show absolutely extraordinary. Be sure Sara that I will stay in contact with you and, as a matter of fact, I might do it soon for some friends who would like to visit China in 2013. Copyright 2001 - 2010. All Rights Reserved to China Tour Guide.